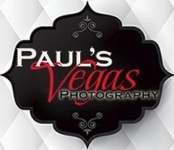 Paul's Vegas Photography does not start and end with Wedding Photography. We are a husband and wife team that strives to keep up with the latest in all avenues of photography. If you are having an event or coming to Las Vegas, Nevada and want to do a special photo shoot such as "Pin-up", "themed", "Vintage", "engagement", or something else you have in mind. We are the team that is up for the challenge. Give us a call to capture that "LOOK"!